Is that the shortest blurb ever, or what? Wowza. For perhaps the first time, I can’t call out a book blurb for being full of blatant lies, if only because it’s one sentence that is also accurate. That might be cause for celebration. Folks, what we’ve got here is a wonderfully good piece of work from the man who brought us La planète des singes and Le Pont de la rivière Kwaï. One might not have to know much French to understand those titles, which were both turned into what I consider two of the best movies ever made. I’ve never read either of the books, each of which were also translated by Xan Fielding, but I think I’m gonna. And I’m also gonna dig up as many other Pierre Boulle books as I can because…wow. This book. I can’t even start. This is going to be one of those reviews where all I can say is that this book is FANTASTIC, so if you’ve come looking for me to bash on another bad one, all I can do is apologize. But first, let’s talk about this front cover, shall we? I dunno. It’s just weird. Not in a good way. The lion thing and the flower don’t make any sense without the context of the book at large, which might be a good thing? I dunno. I grabbed this book because I thought it would be a lot stranger than it was. 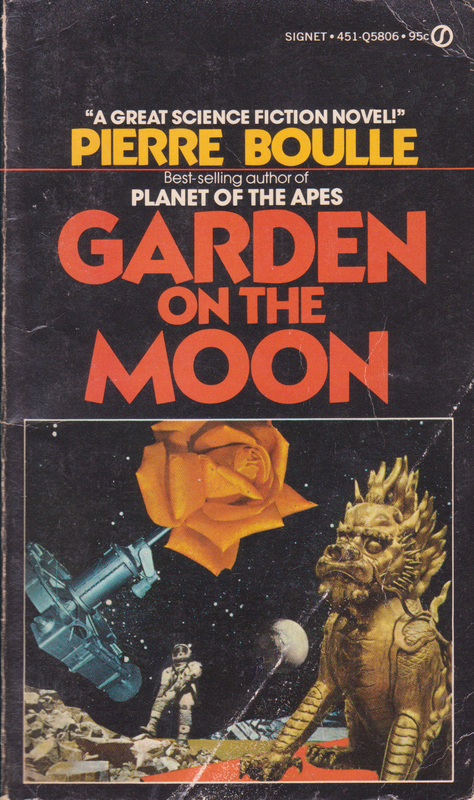 I guess I also expected something more typical of what I normally read, something where it turns out that the moon is a garden world or maybe it’s got inhabitants who convince our astronauts of that. Perhaps something more akin to a Martian Chronicle than what I got. The French title of this book is Le jardin de Kanashima, which sort of spoils things. Maybe it only retroactively spoils them, now that I’ve got the context? All I know is that the title of this book spent a lot of time not making any sense until the end, when I was like “ooooohhhhhhhh SNAP.” It was that good. Everything about this book is that good. See, what took me by surprise is that this book spent about half of its time being straight-up historical fiction. For most of the book we follow the efforts of a man named Dr. Stern. I’m not sure if he was ever given a first name, and none was necessary. Dr. Stern starts off the book as a Nazi. He’s an engineer, a rocket scientist. He cares a lot more about his work than he does about the tenets of the Nazi party, and occasionally this almost gets him in trouble. He’s working on the V-2 project, something that his Nazi superiors are only now coming to see the value of, but he doesn’t want to send missiles to Britain. He wants to send them to the moon. With people in them. It’s hard to tell how much Dr. Stern is supposed to represent Wernher von Braun or just Nazi scientists in general. Yes, Dr. Stern is a rocket genius with big ambitions who becomes sort of a big deal, but I’m not sure that he ever became such a big deal as von Braun. Then again, this book was written in 1964 and goes on to detail some events that take place in its future, so it can be forgiven if it used WvB as a template and then started to get it different from how history really went. So while he’s supposed to be figuring out how to destroy the world in the name of the Reich, Dr. Stern is secretly trying to figure out how to build missiles big enough and efficient enough to go to the moon. As you’d expect, World War II ends in the usual way and Dr. Stern is captured by the Americans. He’s immediately recognized for the genius he is and is sent to work on the American space program. Dr. Stern isn’t the only person working on the project at Peenemünde. He’s got plenty of colleagues, most of whom go their separate ways after the surrender of the Reich. Plenty come with him to America, some, including his most promising worker, a woman named Nadia, go with the Russians, and two, including the Franco-titular Dr. Kanashima, go to Japan. Where this book really shines is in displaying the frantic and competitive nature of the Space Race. Dr. Stern’s team is working desperately to get a rocket that can launch a mere 30 pounds into orbit when the news comes through that Sputnik is up there already, beeping its little battery away. The mood of the book turns from frantic optimism to utter dismay at the knowledge that the Russians are ahead and likely to be the first to put somebody on the moon. This mood intensifies as we follow America’s first attempt at putting a satellite up with the Navy’s ill-fated Vanguard rocket. Humiliated, Dr. Stern redoubles his efforts. So JFK gets elected and things are looking up. There’s a bit of a prologue in this book where Boulle talks about some of the things he got wrong when he was writing this book. I’m super glad he acknowledged them. One of the things he does is have Kennedy in the White House and signing bills and getting the space program going on what is essentially the day after being elected. Boulle acknowledges that this isn’t the way things work in America, and that he got it wrong, but he decided not to fix it because story-wise it works better. I’m inclined to agree. So JFK gets assassinated and things are looking down again. His successor, whom Boulle never refers to as “Johnson,” is not as interested in this moon thing. The tides are turning in the old USA, and apparently Russia too. People are starting to think that this moon shot thing is just a waste of money without a lot of payoff. Dr. Stern convinces not-LBJ that the project is worthwhile by using a simple analogy contrasting the early settlers’ voyages to the New World and how people thought that that was a waste of money without a lot of payoff, but look where it led? I’m not sure how well that analogy holds up, but it works on not-LBJ, so the moon program is go. The project is never referred to as Project Apollo, and we never get any information about Projects Mercury and Gemini, except for an offhand mention of Glenn and Carpenter and how they went to space but didn’t accomplish as much as Gagarin. The Americans are still losing the race, but they’re working their tails off. It’s important to note that while things are proceeding slowly, a lot of that is just because Dr. Stern is methodical and careful. That’s fairly admirable. He’s not going to risk lives, even to accomplish his life-long dream. This is something that the competition does not do quite as well. Up to this point, the book was historical fiction. Now we’re getting to the book’s future and things start to diverge. This was what I was most interested in, figuring it would either be eerily accurate or wildly and entertainingly inaccurate. Folks, I haven’t read a book with this much eagerness in a long while. So the first attempt at a proper moon landing starts rolling in 1970. That’s not far off! Here’s something great, though, that made for such a damned entertaining read. So the Americans announce their launch and start a 30-day countdown. The Russians respond by starting their own countdown. What’s worse, their countdown is a little bit less! Seriously, it’s a matter of about five days. It gets crazier, though: the Russian scheme requires more time once it’s in space. Their orbital maneuvers are a bit wackier than the American ones, which were basically the same things that Apollo did. This means that it’s going to be neck-and-neck. I was expecting that this book would end with the Americans’ hitting the surface just a few minutes before the Russians, or perhaps vice-versa. But this book had still more surprises awaiting me. Near the middle of the book, it was hinted that Japan was also working on a space program. The Japanese stated that they weren’t in competition with the superpowers, they just wanted to launch a few satellites of their own and see what happens. The POV of this book switches over to the Japanese side for most of the rest of this book, which surprised me, but what surprised me more is the fact that the Space Race is now a three way endeavor, and the Japanese are working in secret. It’s going much worse for Dr. Kanashima and his team. See, their plan is to launch three rockets, two containing fuel tanks and another containing the crew capsule, and then use those three parts to continue on to the moon. Stuff starts to go down when the two rockets with fuel tanks explode on the launch pads. Dr. Kanashima is heartbroken. He is convinced that there is now no way for Japan to launch a person to the moon and then bring them back. We cut back to Dr. Stern’s team, counting down the days until the launch. Dr. Stern is working his heinie off to make sure nothing goes wrong. They’re at about T-minus two weeks when they get the news. There is a Japanese man on the moon, and it’s Dr. Kanashima. Japan has won the space race in several ways. For one, they’ve put the first person on the moon. But they’re also going to have the first person die on the moon. I expected that perhaps this would turn into The Martian and we’d have the Americans and Russians team up to save this guy. But nope. It’s not that they aren’t interested. It’s just not possible. Dr. Kanashima is going to die on the moon. So you wanna know where the title of this book comes from? It turns out that Dr. Kanashima builds a little Zen garden out of the moon dust. He also writes a death poem. As his air supply starts to run out, he decides to end it all quickly. The book ends with him rupturing his own space suit and exploding as the vacuum hits him, which I don’t think is scientifically accurate but holy damn is it a good way to end a book. So this isn’t the first time I’ve read a book in translation from the French, but I can say without question that this was the best time. This book was almost perfect. I don’t know how much of the credit goes to Boulle himself for writing an excellent book or how much goes to Xan Fielding for not ruining it, but holy butts, fellows and ladies, this book is well worth your time. I can barely stand it how good this book was. Normally I’d be like “Oh but here are some of the problems” but I’m honestly having trouble thinking of any. If you forced me, I’d say that maybe there weren’t a lot of lady characters with agency, but that’s harsh. For one, there’s Nadia, who goes off to Russia and kicks some asses working at Baikonur. And for two, and this isn’t any attempt to justify anything, ladies were even less represented in STEM careers then than now. Yes, there were some pioneering women in the early space program and I thank the hell out of them for everything they did, but it’s still an unfortunate aspect of history that we can’t ignore, we can only press on and try to do better. Where this book really shined was in emotional resonance. When Sputnik went up and when JFK was assassinated, I really felt it. The shock, the pain, the disbelief, the hope that maybe the TV will come on and go “hey guys, j/k, it’s going to be all right.” I felt that. Without getting too political, I think a lot of that has to do with the events here in the US of the past couple of weeks, events that brought out a lot of emotions that, I’m sure, were quite similar to the ones felt when hearing that there was a Commie beep-beep flying around the world every ninety minutes, or that something bad just happened in Dallas. I felt those tragedies when they happened, thanks to this book, and that’s high praise. So what I’m saying is that you should probably read this one if you haven’t already. I just checked out a copy from the library and am looking forward to digging in!